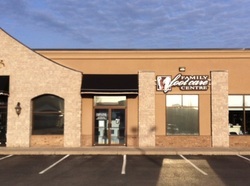 Located in the Carmen Place Plaza, Family Foot Care Centre is a comprehensive foot health clinic focused on giving you the best care possible for your feet. The Chiropodists at Family Foot Care Centre use a number of techniques to treat your foot health concerns. These include: nail surgery, custom foot orthotics, wart dessication, corn and callus debridement, ultrasound therapy, digital appliances and more!